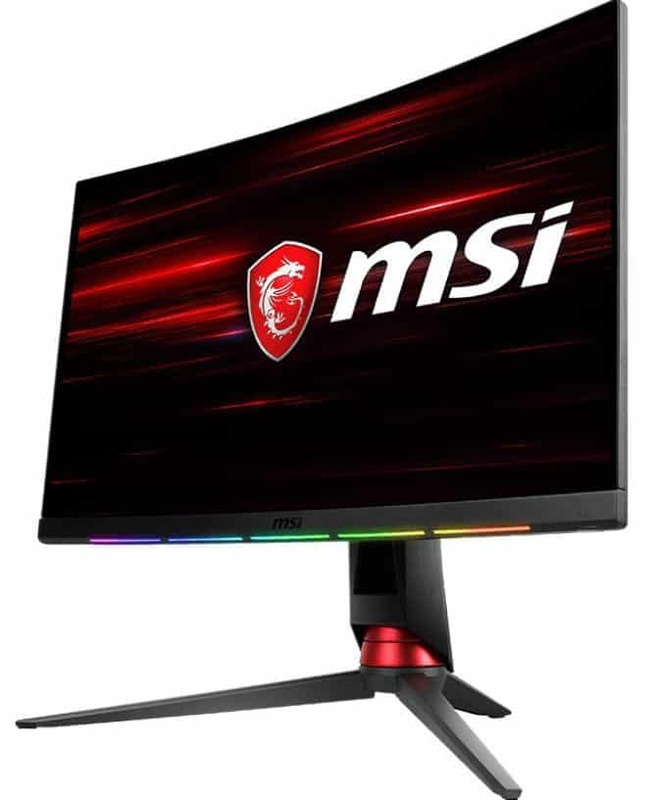 The MSI MPG27C is an RGB-equipped curved 1080p monitor which sports a design that made the series a favorite in multiple expos. Like the QHD MPG27CQ, this monitor was conceived thru a collaboration between MSI and SteelSeries that aims to create intuitive gadgets with a strong aesthetic appeal. Interestingly, these add-ons make the MSI MPG27C more expensive than similar-sized offerings, so let’s take a closer look if it is worth the premium price. The MSI MPG27C sports an exciting and one of a kind design that made it so popular in big-name events. The monitor comes with a matte black chassis mixed with a bit of gloss at the back. The monitor’s appearance is a stark contrast to what the brand used to offer, providing gamers with a more sophisticated and bezel-free aesthetic. One of the distinctive features of the MSI MPG27C is its functional RGB lighting which is fully customizable. Not only do you get RGB syncing controls, but the add-on will also respond SteelSeries’GameSense capabilities and notifications from compatible apps such as Discord. We previously only saw this kind of implementation on keyboards and mice, so it is a welcome addition to the peripheral that has the attention of your eyes more than the others. The LED fiesta extends all the way to the back of the MSI MPG27C’s chassis, which appears on the glossy design strip at the bulge. This area can also be controlled with related apps, or it can double as bias lighting to keep your eyes safe and comfy during extended use. We’re glad MSI decided to upgrade their latest offerings with stands that are more flexible since the older models can only provide tilt. The MSI MPG27C’s telescopic mechanism can swivel, adjust height, and of course tilt, allowing users to get the best view possible. If for some reason this doesn’t suit your setup, you can remove the device and replace it with a VESA aftermarket mount for a different kind of arrangement. Users won’t find any buttons aside from the power switch and the OSD joystick which is a joy to use. It’s a huge convenience for users who often tinker with the settings that they don’t have to go through multiple presses on pesky buttons. Connectivity for the MSI MPG27C is well within reasonable requirements since it includes two HDMI 1.4 slots and a DisplayPort 1.2 receptacle for your video inputs. There is also a USB 2.0 hub with two available slots for convenience, although we would have liked more. Finally, there is a pair of built-in speakers which are loud enough for necessary use but is mostly unsatisfactory for gaming audio. 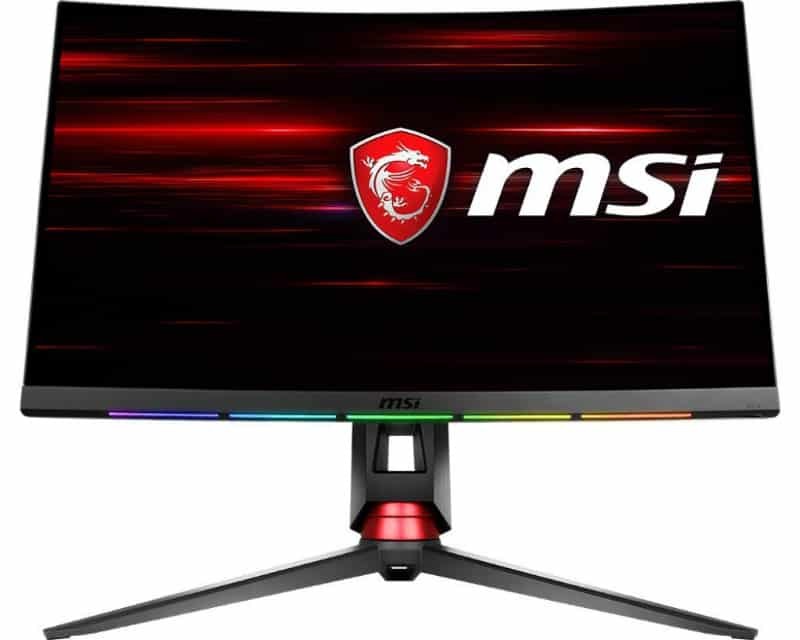 The MSI MPG27C sports a 27-inch curved VA panel with a 1920 x 1080 resolution, 144Hz refresh rate, and 4ms response time. A contrast ratio of 3000:1 with a 250cd/m2 backlight are also listed in the specs, along with a 115% sRGB coverage for excellent vibrancy and color representation. 1080p at this size isn’t the cleanest, looking form factor, but it holds value for E-Sports enthusiasts who want smaller objects like peeking opponent heads easier. We were excited to see the results from the MSI MPG27C when it goes through a colorimeter, but sadly, the scores are quite disappointing. The gamut volume exceeds 100% sRGB easily, plus the MPG27C can provide almost 90% of the DCI-P3 color space. Of course, MSI isn’t advertising this model as HDR-capable, but it has a substantial advantage over some offerings in the market which promise to have some sort of implementation. However, the MSI MPG27C fails in the accuracy department, posting an average color DeltaE of 3.8. This score equates to misrepresentation of some shades. However, the overall image doesn’t appear bland. In fact, we believe the that the low rating is caused by the extra vibrancy of the VA panel. But on a positive note, the MSI MPG27C’s contrast exceeds 4000:1 which is fantastic for deep blacks and rich colors. 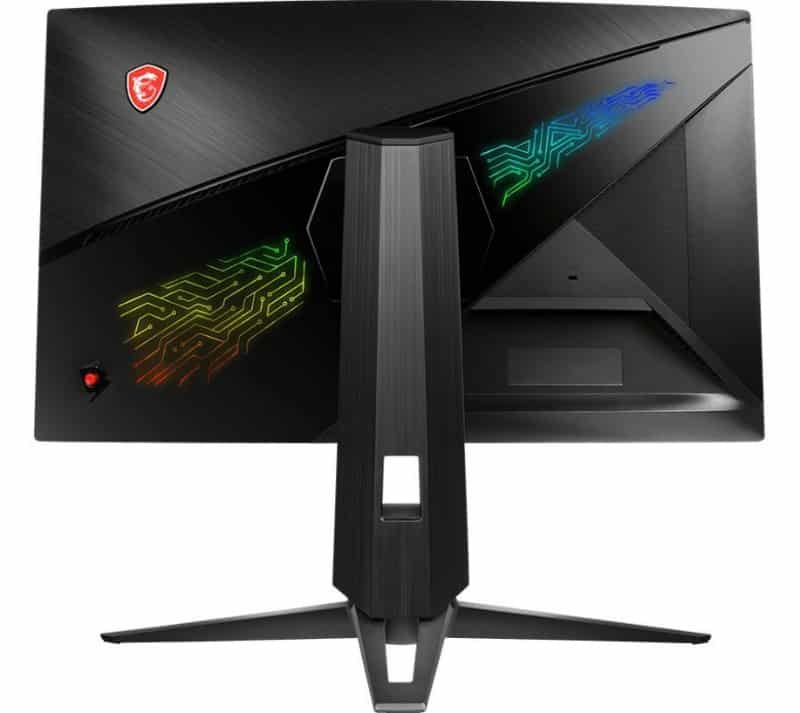 We would recommend this monitor for those who want popping colors for games, but would advise those who dabble in editing to choose another product. What users can do to maximize the display is to adjust according to personal preference with an emphasis on eye comfort. Our test unit also did not display any panel uniformity issues in both brightness and color since deviances stayed below 5%. We usually expect corners to appear worse than the center on curved monitors, but for the MSI MPG27C, this isn’t the case. We noticed some blurs and ghosting on the MSI MPG27C while playing fast-paced games like Overwatch. This is an expected issue from VA panels, but fortunately, the product comes with a 1ms MPRT strobing function. While the feature did lessen the flaws up to some extent, we couldn’t help but complain about the very low brightness. As we all know, backlight strobing locks out most of a monitor’s features while severely reducing the maximum brightness. We think this implementation would receive better reception and usability if MSI chose to add a more powerful WLED array. Finally, the MSI MPG27C is, from the ground up, an enthusiast gaming monitor. You can pair its 144Hz refresh rate with FreeSync if you have an AMD GPU to cure tears and stutters. The monitor’s input lag clocked in at only 9ms, making it highly suitable for competitive settings where latency is highly unwelcome. The MSI MPG27C is a great concept which could outsell some of the big-name offerings from competitors. We love the design and functionality of the RGB LEDs which are more than just decorative features. The monitor performed exceptionally well where it counts for E-Sports fanatics, making it a viable choice for games like Overwatch and CS:GO. However, the product does come with flaws which we hoped not to encounter at this price range. The color accuracy was poor, and the backlight is insufficient to make the strobing feature, which is crucial for avoiding blurs and image retention, a usable tool. If these issues were rectified, we wouldn’t hesitate to recommend the monitor to every gamer out there.